These two paintings are both Baroque renderings of aristocrats from the 1600 to 1700's. One of them represents the older more autocratic traditions of Europe but both are the results of the "Enlightenment. "The way in which they are portrayed are important clues as to how each of these rulers ruled there people and how they saw the world. You will be given an assignment in which you will be asked to compare and contrast these two paintings and come up with some conclusions as to how each ruler is portrayed formally and iconographically. You will be asked what this might mean about each ruler and the manner in which they governed. 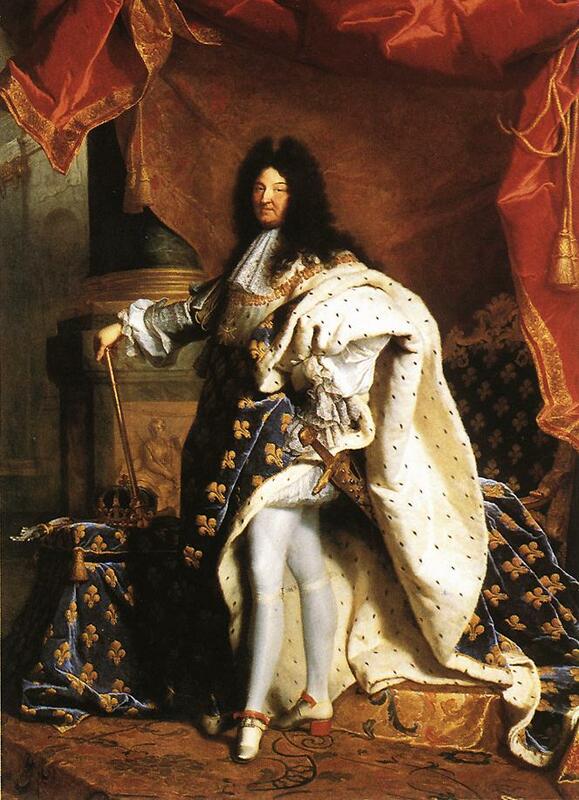 French Baroque Context: This painting was executed just before Louis XIV came into his prime. It represent both formally and iconographically a point of view that is in some ways similar but still different than the Rococo period. In some ways classical images from the Baroque were a bit more "platonic" in nature than during the Rococo.Form: This painting is Baroque and in some ways it is the model for the paintings of the Rococo period. This painting incorporates intense or saturated colors and a full use of chiaroscuro, linear perspective and atmospheric perspective and the pastoral or arcadian landscape. 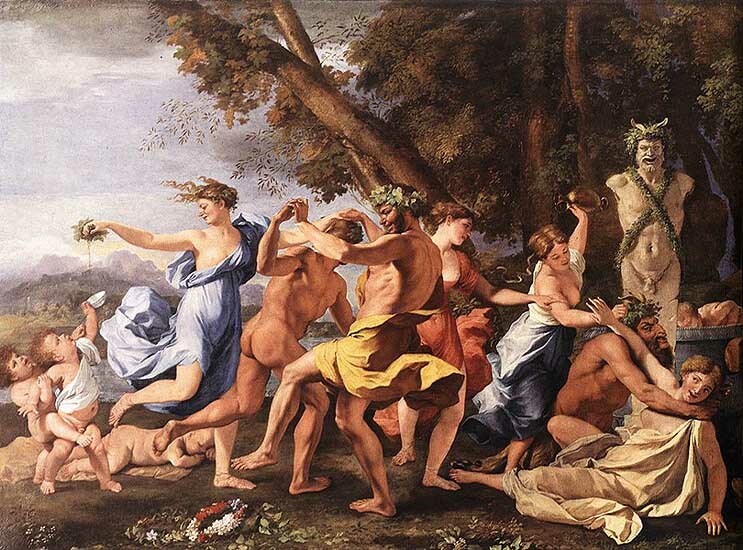 The composition of this image recalls friezes from ancient Roman and Greek buildings and Poussin's figures are also dressed and modeled after classical figures. 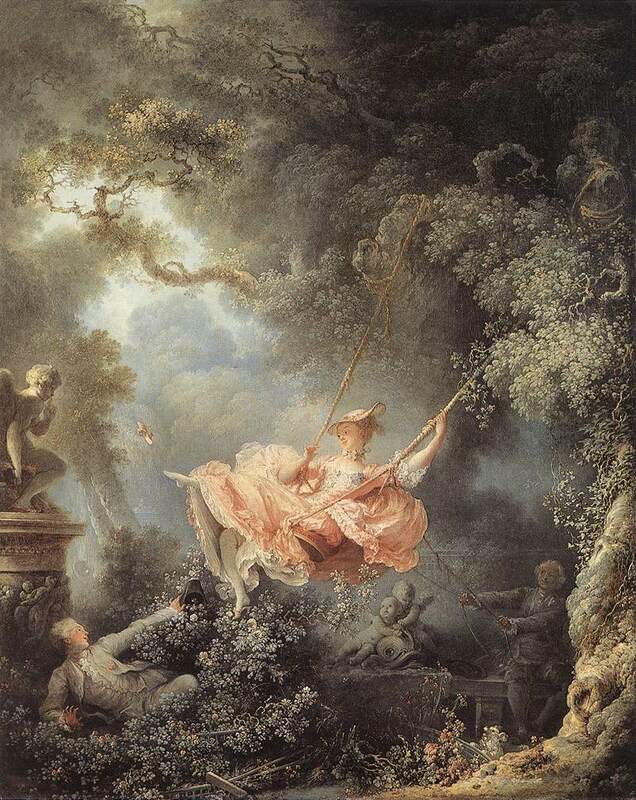 In terms of its form, the Rococo style is uses a lot of pastel colors which are various pale or light colors, such as powder blue, peaches and pinks. The brushwork in many Rococo style paintings tends to be feathery and or rough. Usually the paintings look a bit more like oil sketches and have a rough or unfinished look to them. The compositions also tend to be a bit looser and not very symmetrical.In terms of iconography and subject matter, Rococo paintings do deal with classical themes but the stories emphasize less dignified themes such as love and romantic indiscretion, in short, the "Dangerous Liaison." Stokstad points out that one of the main subjects of the Rococo style was the fête galante. Around the mid-16th century, there emerged in Italy a lively tradition of popular theatre that fused many disparate elements into a vigorous style, which profoundly influenced the development of European theatre. This was the legendary commedia dell'arte ("theatre of the professionals"), a nonliterary tradition that centred on the actor, as distinguished from the commedia erudita, where the writer was preeminent. Although the precise origins of the commedia dell'arte are difficult to establish, its many similarities with the skills of the medieval jongleurs, who were themselves descendants of the Roman mimes, suggest that it may have been a reawakening of the fabula Atellana, stimulated and coloured by social conditions in Italy during the Renaissance.In spite of its outwardly anarchic spirit, the commedia dell'arte was a highly disciplined art requiring both virtuosity and a strong sense of ensemble playing. Its special quality came from improvisation. Working from a scenario that outlined the plot, the actors would improvise their own dialogue, striving for a balance of words and actions. Acrobatics and singing were also used, as well as the lazzi (special rehearsed routines that could be inserted into the plays at convenient points to heighten the comedy). Because the actors stayed together in permanent companies and specialized in playing the same role for most of their professional lives, they achieved a degree of mastery that had been hitherto unknown on the Italian stage and that must have made the rest of the theatre seem all the more artificial. Another reason for the impact of the commedia dell'arte was that it heralded the first appearance in Italy of professional actresses (the best known being Isabella Andreini), though the female characters were never as sharply developed as their male counterparts. Most of the characters were defined by the leather half-masks they wore (another link with the theatre of antiquity), which made them instantly recognizable. They also spoke in the dialect of their different provinces. 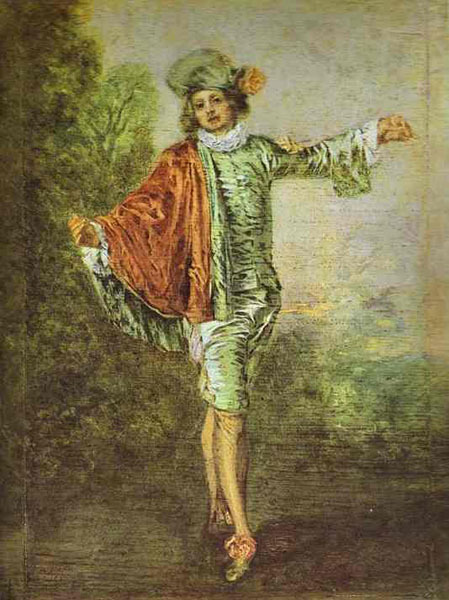 Characters such as Pantalone, the miserly Venetian merchant; Dottore Gratiano, the pedant from Bologna; or Arlecchino, the mischievous servant from Bergamo, began as satires on Italian "types" and became the archetypes of many of the favourite characters of 17th- and 18th-century European theatre. they different? Form: Watteau's palette consists mainly of pastel colors which are various pale or light colors, such as powder blue, peaches and pinks. The brushwork is feathery and or rough and the composition is asymmetrical.The main line of figures that moves across the foreground are arranged almost musically in uneven undulating intervals that weaves in and out of the Baroque diagonal created by the landscape they inhabit. In 1712 Watteau tried once more to go to Italy. He did not succeed, but he was accepted by the Académie as a painter of fêtes galantes--outdoor entertainments in which the courtiers often dressed in rural costumes--for his presentation of a scene depicting actors in a garden. Between 1710 and 1712 he had painted the first of his three versions of the "L'Embarquement pour l'île de Cythère." 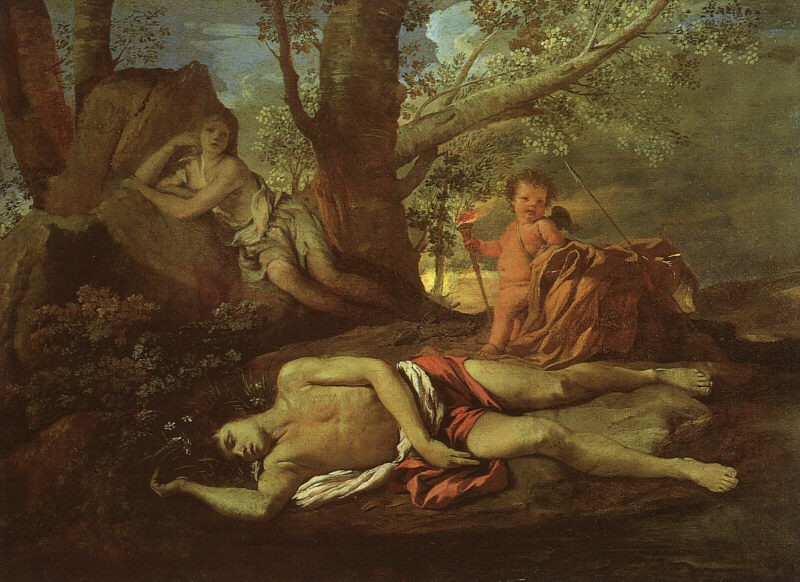 The myth of the island of Cythera, or of love, has distant roots in French and Italian culture, in which the journey is depicted as a difficult quest. Watteau's Cythera, by comparison, is a paradise wavering in the ephemeral and in artifice; it represents an invitation to delights amid the enchantment of nature. It is an island toward which the pilgrims embark but never arrive, preserving it preserves its light only if it remains far on the horizon.Watteau's first version of the subject is anecdotal: it illustrates a comedy motif in a vaguely Venetian ambience. The second--which is the most beautiful--has the aspect of a profane ritual in an unreal, immense, and almost frighteningly empty landscape. In the third, in which cherubim flutter around a golden gondola, the subject has become vulgarized. Common to all three versions is a theatrical, almost scenographic, composition, a chromatic transposition of all that is suggested in the theatrical universe. 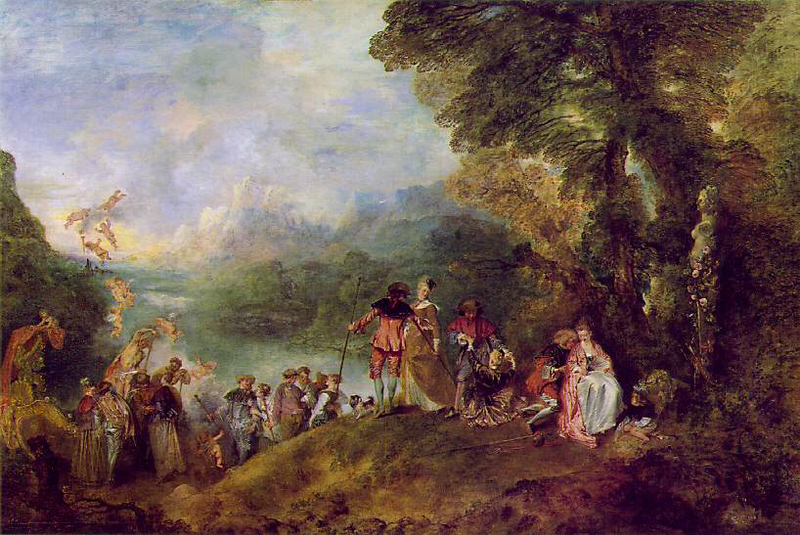 The wonderlands of opera, romance, and epic are all evoked by Watteau's Cythera, which represents the country of the impossible dream, the revenge of madness on reason, and of freedom on rules and morality. According to one hypothesis, the theme was suggested to Watteau by a prose play, Les Trois Cousines (1700), by Florent Dancourt, in the finale of which a group of country youths, disguised as pilgrims of love, prepare to embark on the voyage to the island of Cythera. Since this story of rustic millers is parodistic in intent and quite different from the refined scene that Watteau set in an unreal Venice, it is more probable that Watteau was inspired by an opéra ballet of Houdar de la Motte, La Vénitienne (1705), in which the invitation to the island of love includes not only the pilgrims of Cythera but also the stock characters of the commedia dell'arte--that is, both of the great themes that Watteau pursued all his life. 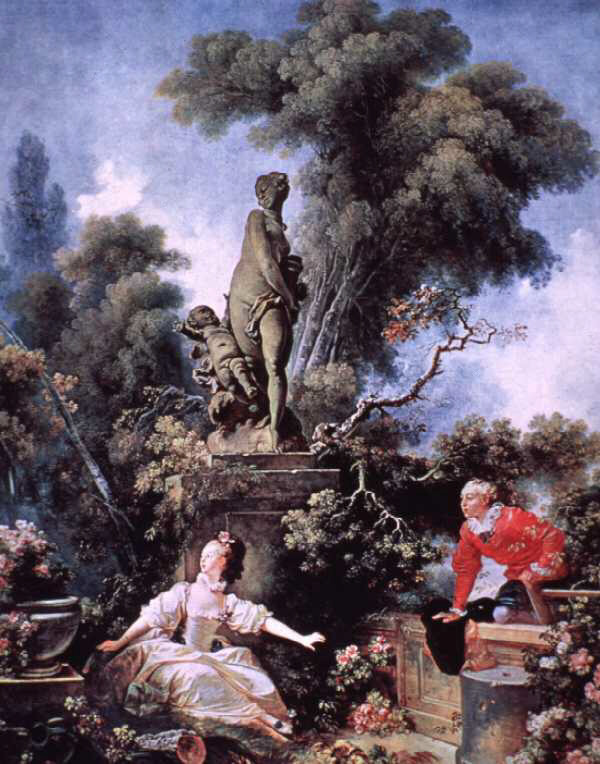 French Rococo Form: Fragonard's palette is almost exactly the same as Watteau's. It too consists mainly of pastel colors which are various pale or light colors, such as powder blue, peaches and pinks. The brushwork is feathery and or rough and the composition is asymmetrical.The main line of figures that moves across the foreground are arranged almost musically in uneven undulating intervals that weaves in and out of the Baroque diagonal created by the landscape they inhabit. The sculpture of Cupid and the two putti that hide in the bushes are an attempt in some ways to "dress up" the images with a classical touch. The cupid presses his fingers to his lips as if to warn the young woman to be less obvious as she kicks her shoe off playfully.Fragonard also attempts to show his knowledge not just of classicism but also of art history with his playful nod to Michelangelo's Adam echoed in the pose of the young man who looks up his lover's skirts. 1771-73 o/c 10'x7' New York, Frick Museum Form: In terms of form, this image is a perfect example of the Rococo style according to Stokstad's description of it.Iconography: The works symbolism is almost completely clear even if one is not familiar with the exact story expressed by the series the Love of the Shepherds. Here is a typical "dangerous liaison" as expressed in the two poems above by Marlowe and Raleigh. The scene is a pastoral one, in fact the boy in red silk is the shepherd who vaults lightly over the low wall to meet his wary girlfriend. Above them, almost in a decaying state because it is so overgrown, is a statue of Venus and Cupid.